Nelson may not look big but in truth the forward is a rebounding machine. Three starters are back from a dangerous second-place finisher in the Pac 10. Now with Utah and Colorado coming in it won't hurt the Bruins. The frontcourt is stocked with talent with center Joshua Smith, forward Reeves Nelson and the arrival of former North Carolina star recruits David and Travis Wear. Smith has real talent and will improve even more in his sophomore season. 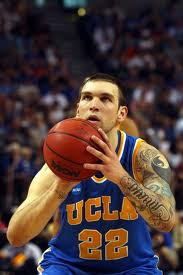 He'll constantly carve out space underneath and gives the Bruins a talent inside as good as Tyler Honeycutt was. The Wear brothers aren't dominant but should get some big minutes this season. Reeves Nelson may not be huge but he can rebound like a center. He currently leads all returning Pac 12 players in rebounding with 9.1 rebounds per game. Junior Brendan Lane is big but still has a good shot and will play some minutes. The backcourt isn't as strong but still has talent thanks to the return of Lazeric Jones. Jones won't change any games but he is effective and smart. Ben Howland brought in a number of freshman that will play constantly at guard with guys like Norman Powell and former junior college man De'End Parker. Bottom Line: The Bruins are coming back but the backcourt will keep them from getting back to the Final Four.